A small team of researchers from the U.S. and Tunisia has found evidence that suggests a huge asteroid that struck the Earth approximately 66 million years ago caused the planet to warm up for approximately 100,000 years. In their paper published in the journal Science, the group describes their study of oxygen ratios in ancient fish bones and what it revealed. 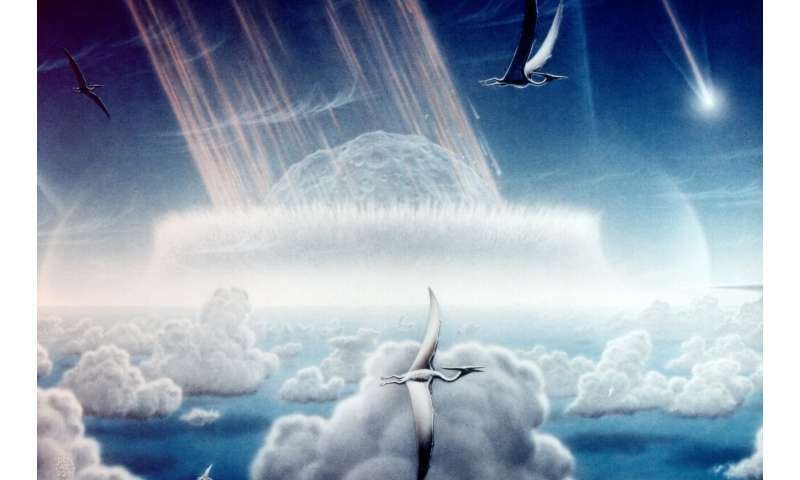 Prior research has shown that approximately 66 million years ago, a massive asteroid struck the Earth at a point near what is now Chicxulub, Mexico. Other studies have suggested the sudden change in climate that resulted is what caused the dinosaurs to go extinct. The belief has been that the smoke and particles thrust into the atmosphere blocked out the sun causing the planet to cool for a long period of time. In this new effort, the researchers suggest the cooling period likely was shorter than thought and that it was followed by a lengthy hot spell. The researchers came to this conclusion by studying the bones and teeth of ancient fish. The fish remains were sifted from sediment samples collected at a site in El Kef, Tunisia. During the time before and long after the asteroid strike, the area was covered by the Tethys Sea. The researchers looked at oxygen ratios in the fish remains as a means of determining the temperature of the water at the time that the fish died. Collecting samples from different layers allowed for building a temperature timeline that began before the asteroid strike and lasting hundreds of thousands of years thereafter. In looking at their timeline the group found that sea temperatures had risen approximately 5°C not long after the asteroid struck and had stayed at that temperature for approximately 100,000 years. The researchers suggest the strike by the asteroid very likely released a lot of carbon dioxide into the atmosphere because the ground area where it struck was rich in carbonates. The strike very likely would have also ignited large long-burning forest fires which would have also released a lot of carbon into the air. The evidence suggests that the cooling after the impact was short-lived as massive amounts of carbon dioxide were released into the atmosphere setting off global warming. The researchers note that a lot more work will need to be done to confirm their findings. Another site will have to be found with similar evidence, for example, to prove that the warming was not localized. Greenhouse warming is a predicted consequence of the Chicxulub impact, but supporting data are sparse. This shortcoming compromises understanding of the impact's effects, and it has persisted due to an absence of sections that both contain suitable material for traditional carbonate-based or organic-based paleothermometry and are complete and expanded enough to resolve changes on short time scales. We address the problem by analyzing the oxygen isotopic composition of fish debris, phosphatic microfossils that are relatively resistant to diagenetic alteration, from the Global Stratotype Section and Point for the Cretaceous/Paleogene boundary at El Kef, Tunisia. We report an ~1‰ decrease in δ18O values (~5°C warming) beginning at the boundary and spanning ~300 cm of section (~100,000 years). The pattern found matches expectations for impact-initiated greenhouse warming. Or the impact created massive undersea faults and volcanoes that spewed magma into the ocean, warming it from below. This CO2 hypothesis suggests the researchers started with a goal --- posit another time when demon CO2 messed up the planet --- and lo! there it was. Or at least they claim enough evidence to warrant "a lot more work." Scientists have to eat, too. Their conclusions are unfounded. No one has suggested that disequilibrated CO2 levels in the atmosphere persist for tens of thousands of years. Furthermore, it doesn't matter how much carbonate ocean sediment was "vaporized" : There is an upper bound to the amount of heating that can be caused by atmospheric CO2. IR saturation occurs when CO2 levels exceed 600ppm --- no further warming from CO2 beyond 600ppm because the available IR energy has all been captured. I'll be checking RetractionWatch dot com for the rest of this story. And no credible model with the maths of this calculated has so far suggested that that could have been the cause of the warming. If you disagree, show your physics equations and maths calculations for it. No, it clearly doesn't 'suggest' that. And there is no evidence to support your above conspiracy theory. But there is evidence to support this particular CO2 theory; the rocks the asteroid hit are very high in carbonates and thus large amounts of CO2 would have been released from the impact. When carbonates are vaporized, they do indeed release CO2. This can be (and was) confirmed in the lab. The theory makes sense. It can even be viewed as yet more evidence of CO2 warming. IR saturation occurs when CO2 levels exceed 600ppm --- no further warming from CO2 beyond 600ppm because the available IR energy has all been captured. You lie. That is made up claptrap. There is no clear "IR saturation" point; not at "600ppm" nor an any other specific figure. And where did you get the "600ppm" figure from? Why not, say, 500ppm or 700ppm? That is totally arbitrary and baseless. The atmosphere isn't just absorbing IR Radiation from the surface. It is also radiating IR Radiation to Space. If these two heat flows are in balance, the atmosphere doesn't warm or cool - it stays the same. But that means, with all else equal, adding any CO2, no matter how much is already there, will cause climate warming. Thus there's no real saturation point. The warming effect is approximately proportional to the logarithm of the concentration, so each extra ppm will do less but there is no 'cut-off' point. ... they demonstrated how CO2 saturation is false by modeling the atmosphere with twice as large of a concentration of CO2 as is present now. What was found was that CO2 increases the temperature in the troposphere. With a larger increase in the troposphere than anticipated because of a radiative-convective equilibrium model. It was also found that there would be an even more dramatic increase at the higher latitudes because of the recession of the snow boundary (Wetherald). This disproves the thought of CO2 saturation as a limiting factor in climate change. Learn real science; not myths political propaganda and lies. that the heat is absorbed by CO2 only but it's radiated by all components of atmosphere in an equal way once the heated CO2 molecules exchange their energy with them. look up the word "Therefore" in the dictionary and come back to us. Your assertion clearly doesn't follow from your premice. because the absorption curve will be way more complex if modeled properly: with both saturation point, both runaway point. No, there is no definable 'saturation point' nor 'runaway point' to complicate it. The curves are complex but still approximately logarithmic in this case and that complexity is obviously taken into account by the scientists that model it. This is just a mainstream propaganda similar to claim that cold fusion or antigravity don't exist. What kind of ridiculous conspiracy theory is that? The reason why few scientist now believe cold fusion exists is that the experiment claimed to result in cold fusion didn't result in cold fusion when duplicated in other labs thus leading to the conclusion that the claim was bogus. Most of the scientists that wanted to believe cold fusion (but now obviously wouldn't) also believed and believe greanhouse theory; why not? And What! You also believe in the existence of some kind of 'antigravity' devise? Where do you get this crap from? http://www.scribd...-Theory. This theory was published in standard scientific way - so I do expect, all counterarguments would link their sources published in the same way. Someone comes up with a theory. If that theory is disproved, what should happen is that the theory is dismissed by science. Anyone that continues believing that disproved theory is no longer a believer in science but in junk. So, they checked for O2 levels so that they could claim an increase in temperature and then, of course, concluded that this was due to CO2. Why not check for the very thing you are claiming? CO2 levels. Miskolczi's work is from 2005-2007 - it couldn't be debunked before it. Actually it was. The actual relationship between CO2 concentration and warming effect was worked out by basic science and with empirical evidence well before 2005 and that relationship was approximately logarithmic and without any specific 'saturation point' thus his hypothesis can be argued to be debunked before he said it i.e. it was a none starter and it is then only a trivial task to explicitly debunk it after he said it. And yet your link is to a PowerPoint presentation, not a peer-reviewed paper. Lie much? The 'saturated greenhouse effect' hypothesis doesn't even make any physical sense because it ignores extremely basic known physics. CO2 absorbs different wavelengths of the outgoing infrared by different amounts; some wavelengths are absorbed strongly and others only very weakly. To keep this explanation simple, suppose we pick an exact wavelength that is such that current levels of CO2 absorb exactly 50% of it (from the ground to outer space). therefore there is no 'saturation point'. This is just a presentation with links to original papers (http://ruby.fgcu....lear.pdf counts for in crackpot index? The scientific community is bunch of opportunist bastards. And you are a non-event crank. Live with it. Errrr, they do. And have been for many decades. Some chap on Hawai'i started it. Can't be bothered looking it up. It is common knowledge. I'm referring to the PERIOD in question, where they determined O2 levels but NOT CO2 levels. You can't be bothered to read and comprehend...but rather bray like a jackass. How so? It clearly doesn't. You make absolutely no sense whatsoever. As all measurements confirm, it isn't immediately reradiated out as infrared light but rather conducted out as thermal random motion of neighbouring air molecules. (not to say about water once it condenses into a droplets). what has that got to do with it? Are you saying clouds complicate it? If so, yes they do but not in a way that would cause a 'saturation point' so that's still irrelevant. In short, you have said nothing there to counter my explination. In addition, your simplistic model explains neither temperature profile of stratopause, ..
and it isn't supposed to because it isn't an explinations for that. I actually happen to know the explanation for that; which is irrelevant to my first explination because that is for a different topic. You do love constantly going completely off-track. Are you saying clouds complicate it? If so, yes they do. But not in a way that would cause a 'saturation point'. The condensation of water vapor induces a new saturation effect, even more pronounced one: once the Earth gets covered by clouds, . No the Earth won't get all covered in clouds. At any point in time there will still be clearing between the clouds somewhere on Earth i.e. clear skies and about the same area of clearings. And no "new saturation effect". Please don't make crap up.